The Rams were in front of the Sky cameras and appeared to have stage fright in the opening fourty five minutes. A resurgent Fulham took the game to Derby who had little or no reply. The Rams had a late re-shuffle of the starting line-up when Andrea Wisdom had to withdraw for family reasons and was replaced by Chris Baird. Baird again showing good form in the right back position. Fulham took the lead in this game from a second free kick following a rather tamely given free kick after Rui Fonte appeared to fall into Curtis Davies. The resuting free kick was accidentally handled by David Nugent as he jumped with the rest of the Rams wall. 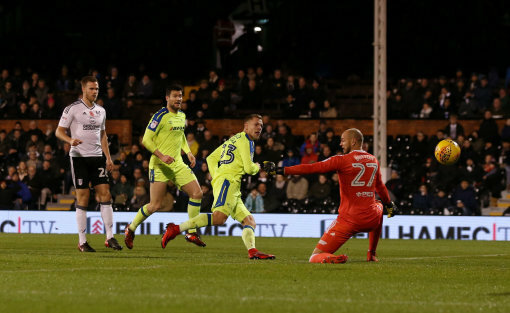 The second free kick was a good strike by Oliver Norwood from 25 yards but three Fulham players had attached themselves to the Rams wall and as they ducked leaving a large gap, the ball was rilfed in and past Scott Carson into the roof of the net. A fairly central shot which Carson failed to deal with and was clearly not happy with his defenders showing them three fingers and asking why they had let the Fulham players join the wall, or at least not stood behind them. Derby just didn't look to have the means or effort to get back into the game during the first fourty five minutes but they defended well and rode their luck to go in at the interval just one goal adrift. The second half was a different game, as can so often happen with the Rams and being quicker to the ball and runs made life difficult for Fulham, who were not having things their own way as in the first period. A ball gained in midfield by Tom Lawrence saw the talented Wwelsh International weave his way past two Fulham defenders and slot a sublime ball through to Matej Vydra who left the Fulam keeper rooted to the spot as the ball net the back of the net.